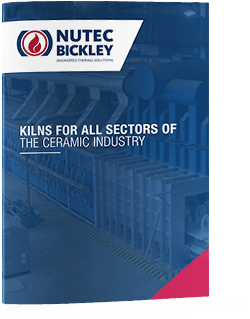 Nutec Bickley’s Elevator Kilns are available with updraft or downdraft exhaust designs and are ideally suited for high temperature firing of small batches. These kilns are used extensively in the technical ceramics industry and for pilot production of refractories and specialty ceramics. Similar to the Carbell® kiln model but for smaller capacities, the elevator kiln is designed for a stable and repeatable seal between the kiln and car, while providing a strong and robust structure for the refractory insulation. This is essential for firing at high temperatures but also beneficial at lower temperatures since the kiln seal is more reliable than a shuttle style of door seal. The basic concept of the elevator kiln is an enclosed box-like structure without any doors that is supported by columns at the corners. The product to be fired is loaded onto a car that travels on rails to/from the kiln lifting platform under the kiln structure. Once the loaded car is placed into position and locked into place, the platform is raised lifting the loaded car into the kiln from below. The lifting platform is raised by electrically driven silicone protected legs, one at each corner of the platform. When the car is fully raised a seal blade on the kiln structure engages the sand seal trough around the perimeter of the car. The blade is made of alloy steel and is water cooled that provides a robust and durable seal mechanism. The exhaust of the elevator kiln can be a natural updraft or downdraft design. The roof of the kiln has flues that allow combustion gases to vent out upward. Above the kiln is a hood and stack assembly to exhaust the gases up and out of the building. The kiln car has a single flue in the center of the car. Attached to the underside of the car is an insulated duct the couples to the car flue. When the car is fully raised, the underside duct aligns with external exhaust ductwork that is connected to an exhaust fan and stack to exhaust the combusted gases out of the building. Automatic control of the pressure for down draft designs are done by varying the speed of the fan and is crucial for achieving peak performance of the kiln temperature control. 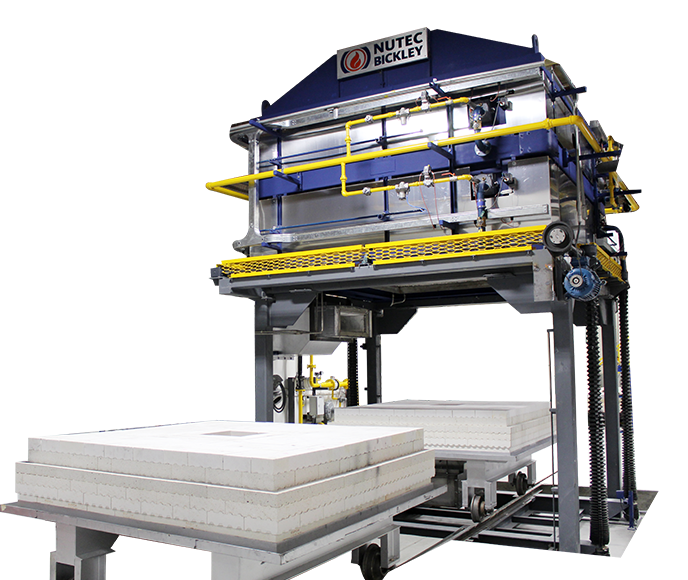 The elevator kiln can be designed to use multiple cars that can be simply shuttled to and from the bell location. This makes re-firing the kiln quicker and more productive than a single car use. Burners are typically positioned at the corners of the elevator kiln. 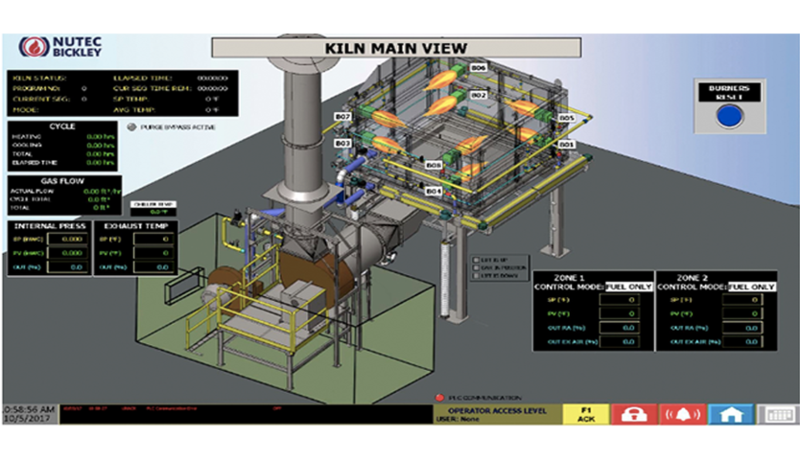 With our SCADA systems, the kiln operators are able to have complete control of their firing process, enhancing efficiency and productivity. Our latest Industry 4.0 developments integrate the latest technology to not only monitor the process, but also to keep the kiln operating in its peak performance with smart maintenance technology. All the data generated during the firing process is stored in our SCADA system, which then is used to generate reports, graphs and intelligence data, to help customers in their decision making process. Use of stainless steel sand seal blade with water cooling for longevity and low maintenance. Heavy duty silicone protected legs with high temperature silicone protective boots. Multiple control zones (competition usually only has one zone). Can come with various combustion designs that include on-ratio, excess air, excess fuel, pre-heated air, oxygen enrichment and pulse firing. Robust steel design using thick wall structural tubing, 316” (5mm) sheet steel and secondary outer layer of brushed aluminum.